As part of the Science for Our Nation's Energy Future: Energy Frontier Research Centers Summit, the Department of Energy's Office of Basic Energy Sciences (DOE BES) is sponsoring a video competition. 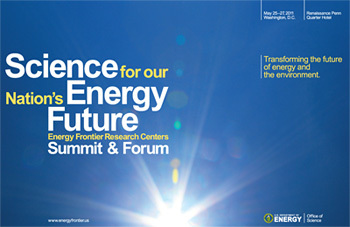 The Life at the Frontiers of Energy Research competition seeks short, engaging films that educate, inspire, and entertain an intelligent but not expert audience about the extraordinary science, innovation and people in the Energy Frontier Research Centers (EFRCs). A video could highlight a scientific breakthrough, show collaboration in action, give a window into the life of a scientist or student, or illustrate the impact on society of an EFRC's mission. Be creative and have fun. Content primarily supported by or attributed to the EFRC program. Submit videos to a YouTube account or channel of your choice. The EFRC director submits the video title and YouTube link to the EFRC's official video entry. Technical requirements: 16x9 aspect ratio (high definition). Otherwise, follow the YouTube video guidelines. Keep in mind that winning videos will be shown on a large screen during the Summit and streamed on-line after the event. Up to five videos will be selected by the external jury. Among the criteria, the judges will consider the impact of the science, the clarity of the storytelling, the portrayal of early career scientists, the innovative use of music, and the creative delivery of the EFRC's mission. A winning video will not necessarily incorporate all of the above characteristics. Think Academy Awards: The Sound of Science for Best Musical, March of the Postdocs for Best Documentary, or Portrait of a Scientist for Best Portrayal of Early Career Scientists. Each EFRC uploads the official video entry to its own YouTube account or institutional YouTube channel. The EFRC director sends the title and the link to a representative on the BES EFRC team (Robin Hayes). A jury of three to four illustrious judges external to the Department of Energy, chosen by the Office of Basic Energy Sciences for their cinematic, musical, and scientific expertise, will judge submissions received before the deadline. They will select up to five videos as winners. Submitted videos may be screened during the three day Science for Our Nation's Energy Future event and featured on the DOE YouTube channel, Science for Our Nation's Energy Future website, and DOE websites. Two students or postdocs from each winning team will have their expenses paid to attend the Science for Our Nation's Energy Future event. Up to five winning teams will be honored onstage and their videos screened during the plenary session directly before the reception and poster session on May 25, 2011. People's Choice Award—An award ceremony on May 25 will publicly recognize the video with the most votes recorded on the Science for Our Nation's Energy Future website before 5 pm Eastern Time on May 24, 2011. OFFICIAL RULES for the Life at the Frontiers of Energy Research Video Competition.